Eduardo “Lalo” Murillo is heading to college on a full ride. The Lost River High School senior recently found out he is one of 110 Ford Scholars, which will pay for about 90 percent of his tuition. The rest of his college will be paid for by scholarships from his college of choice, Lewis & Clark. Part of the extensive application process for the Ford scholarship was writing four essays. One focused on how students help their family. Murillo wrote about how he worked weekends and summers to help his family. His parents, Eduardo and Norma Murillo, support four children. Murillo said he also worked farm jobs for Lost River Football Coach Dennis Dunlea. Murillo moved pipe, drove tractors, baled hay, changed wheel lines – whatever needed to be done. Dunlea said Murillo is a leader on the football team and in the community. 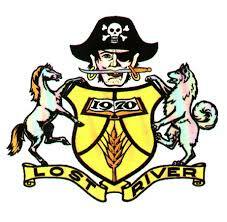 This was all while keeping involved in academics, sports and clubs at Lost River. Murillo played football and track and was a member of FFA, FBLA, VEX Robotics, Leo’s Club and Malin Community Service Club. Murillo plans to study medicine or pediatrics at Lewis & Clark, with the eventual goal to return to Malin and open a clinic to help his hometown community. He said his sister Yareli inspired him to pursue medicine. “Growing up around my older sister, she’s really into helping others,” he said. “To see her so enthusiastic and passionate about what she wants to do influenced me. Along with his work ethic, commitment to school and plans for his future, Murillo credited his participation in the LEDA in helping him earn his scholarships and getting into Lewis & Clark. LEDA stands for Leadership Enterprise for a Diverse America. In the summer of 2017, Murillo spent seven weeks Princeton, N.J., learning life and college-ready skills and making connections with other students in high school and college. The skills he learned at LEDA helped Murillo in his application, he said. He turned to his LEDA mentor, along with Johnson, in completing his applications to scholarships. “It’s a life changing experience,” he said.